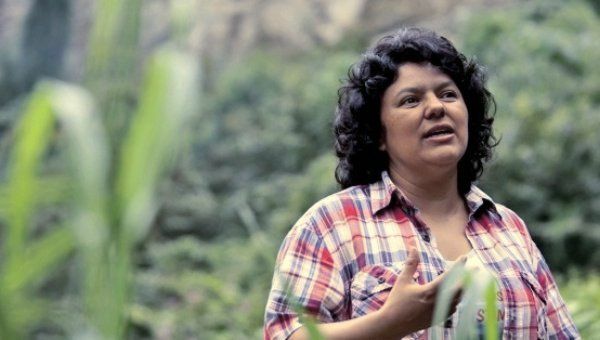 On March 15, just days after the assassination of Indigenous leader Berta Cáceres, news surfaced that one of her comrades, Nelson García from the Río Chiquito community, had also been executed. Berta and Nelson both belonged to the Civic Council of Popular and Indigenous Organizations of Honduras (COPINH ). According to a COPINH communique released by the Honduras Solidarity Network, Nelson was assassinated when he broke for lunch at his mother’s house after “having spent all morning helping to move the belongings of the families being evicted” in Río Chiquito. Violent evictions were taking place just before Nelson’s assassination where “approximately 100 police, 20 members of the militarized police, 10 soldiers and several members of the … investigative police” had invaded the area that 150 families had heroically taken over. More than 75 of the families that had built homes in Río Chiquito with materials they had been able to find were evicted, their houses and gardens, and a community oven destroyed. The community’s chickens were also killed. Little explanation is given as to who commits the violence and why. But the recent murders of Indigenous leaders and community activists are directly related to the 2016 U.S. presidential elections, especially the candidacy of former Secretary of State Hillary Clinton, who has responsibility for the killings. Since 2009, a remarkable percentage of the violence has been directed at the resistance movement. Murders, beatings, rapes and threats have all been waged against anyone who organizes for their basic rights. The national homicide rate for women is 14.6 per 100,000 inhabitants, making Honduras one of the most violent and dangerous places in the world for women, according to the community-based Jesuit station, Radio Progreso. To report this news is an act of resistance itself. One of Radio Progreso’s very own reporters, Carlos Mejía, was killed in May 2014. International journalists have been detained, including reporters for Telesur, while others have received death threats or have been murdered. Every sector in society has been targeted: campesinos/as, the Garifuna nation and political activists. Since 2009, more than 30 union members have been killed, according to a Nation magazine report of December 2015. In December 2009, a well-known international LGBTQ activist, Walter Trochez, who had traveled to the U.S. to speak about conditions in Honduras, was executed. The world mourned his loss. It is no wonder, therefore, that mothers send their children up north to the U.S., or families find some other way to escape the violence. Fighting for LGBTQ rights or just for a roof over your head or to stop a corporate dam from taking over ancestral lands is cause for assassination. You don’t have much choice. No matter how treacherous the road from Honduras to the U.S.-Mexican border, mothers, fathers and whole families are caught between a bloody rock and a very hard place. During the Feb. 11 Democratic Party debate in Milwaukee, both Bernie Sanders and Hillary Clinton were asked about their solutions to the recent “child migrant crisis” that had captured the news some time back. Almost exactly one month later, during the Miami debate on March 9, Latino moderators sharply asked the question, “Would you as President deport children?” Both amazingly said no, although Sanders more forcefully. Clinton not only flip-flopped from one month earlier. Neither she nor the moderator pointed out her own role in the mass exodus from Honduras to begin with. Secretary of state then, Clinton more than supported the 2009 illegal coup that ousted President Manuel Zelaya. 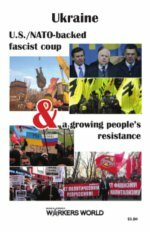 “Hillary Clinton was probably the most important actor in supporting the coup in Honduras,” according to American University professor Adrienne Pine. But you don’t need to go all the way to Washington to hear that. Berta Cáceres had said that herself many times. Why was Zelaya so dangerous to U.S. imperialism? Why did they want him out? The International Action Center sent a delegation to Honduras with Honduras USA Resistencia not long after the June 2009 coup. Juan Barahona, labor leader and representative of the National Front of the People’s Resistance (FNRP), told the delegation that Zelaya was about to support a major raise in the minimum wage. Others corroborated this, with some saying the raise was 60 percent. “This infuriated two U.S. companies, Chiquita Brands International (formerly United Fruit) and Dole Food Company,” said John Perkins, author of “The New Confessions of an Economic Hit Man,” in an interview with the website Truthout. The big corporations feared that a rise in Honduras’ minimum wage could spread to other countries in Latin America. The illegal, U.S.-backed coup ousted a progressive president and ushered in a wave of repression. Hillary Rodham Clinton has the blood of Berta Cáceres, Nelson García and the over 25,000 people that have been killed since 2009 on her hands.